There are different types of Tellink’s Smart Lighting Management solutions. This chapter describes Tellink’s Smart Lighting Management system at street-cabinet level. There are other versions of the system that manage lighting at every individual luminaire. Please contact Tellink should you want to know more about other Tellink’s Smart Ligting Management systems or should you require a customized solution. Who is TSmarT-Lighting-CM system suited for? The system has been designed for those organizations in charge of manage or maintain public or private lighting networks as well as by those companies that offer control and maintenance services of lighting infrastructure as part of their offering. Typical users of TSmarT-Lighting-CM include Energy Services Companies, Energy Efficiency Consultancy Companies, maintenance Services Companies, Smart Metering cloud platforms, local governments, Highway Concessionary Companies, to name just a few of them. The System is composed by the three components showed in next graphic. Two of these components are typically installed at the street cabinet that controls a group of street lights: Control and Communications Unit, and Three-phase Power Analyzer. On top of that, a piece of Tellink’s software FacTel-iNT needs to be installed at the Control Center server so that the System can be remotely managed. 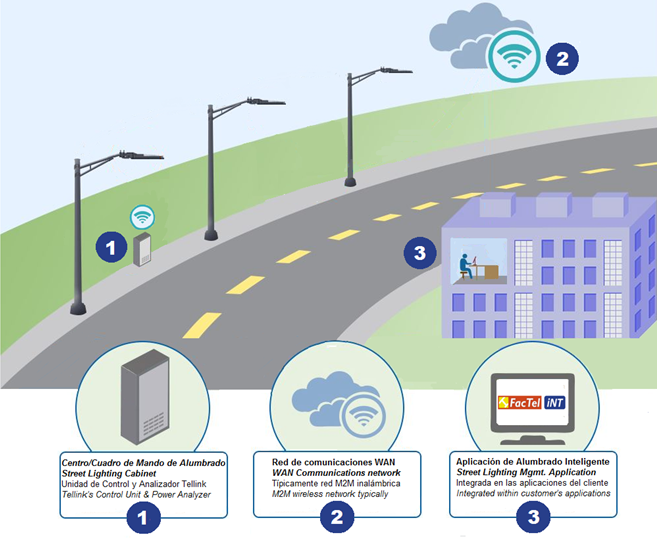 Communications between Control Center Server and street cabinet components are typically implemented via a 2G/3G/4G wireless network or via an Ethernet based wireline network. • Real-time detection of deviations versus pre-set values regarding energy consumption, and other important electric values. 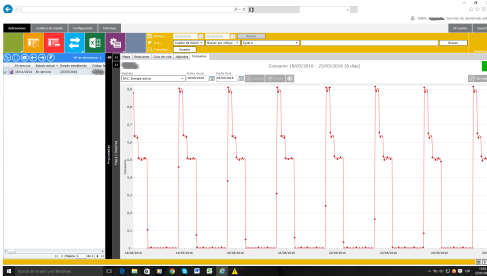 Tellink’s System includes an alarm module that informs the maintenance crews about any relevant event or failures affecting the Street lighting network. The alarm module generates significant reductions on maintenance cost as well as increase of service level by reducing the reaction time. • Pre-programmed ON/OFF switching of street lights according to astronomical algorithm included as part of the system. By doing so, streets lights get switched ON/OFF based on every day’s specific sunset and sunrise times. Tellink’s system also allows manual or pre-set ON/OFF switching should any city event requires an unusual lighting level (i.e. festival or unexpected traffic accident). • Ability to measure external sensor values (temperatura, humidity, presence, etc.). To do so, Tellink’s system equips an I/O communication module where external sensors are connected. 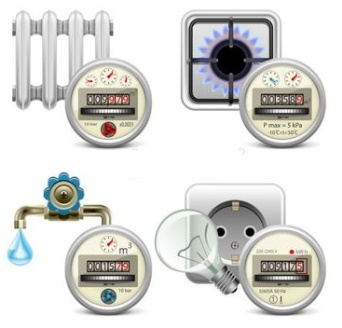 • Ability to include real time metering of water, gas, and in general any fluid consumption. To do so, Tellink’s system includes a number of accessories designed to obtain consumption information out of many commercial fluid or gas meters. • Suite of software management applications, easy to integrate as part of the customer’s Software Management system or as part of an Smart City platform. FacTel-iNT represents no recurring cost for the customer.